The Africa Center’s International Alumni Chapter, based in Addis Ababa, Ethiopia, recently met with Ms. Amanda Dory, the Deputy Assistant Secretary of Defense for African Affairs, for an exchange of views on African peace and security and U.S.–Africa defense relations. The meeting, facilitated by the Africa Center’s Addis Ababa–based Regional Office for East Africa in Addis Ababa, brought together a select group of alumni and community members: Ambassador Olusegun Akinsanya, Director of the Addis Ababa Office of the South Africa–based Institute for Security Studies (ISS); Mr. Samuel Assefa, Resident Representative of the Africa Capacity Building Foundation and Former Ethiopian Ambassador to the United States; Mr. Tamrat Kebede, Executive Director of the Inter Africa Group (IAG); Professor Gebru Tarekegn, an African military historian; and Dr. Solomon Ayele Dersso, a Senior Researcher in the Peace and Security Council Program of the ISS. The meeting took place in late February. Alumni members raised serious concerns about the political crises in Mali and South Sudan. The U.S., in their view, needed to craft more proactive policies based on balancing the need for short- to medium-term security assistance and conflict resolution while working with partners to support mechanisms to address deeper underlying grievances. Institution building, social development, transfer of skills and applicable technologies, and expansion of education needed to be prioritized as part of a comprehensive partnership, they said. U.S. assistance is perceived as militarily-focused, the group said, a perception that persists despite the vast amount of development work that the United States supports through the U.S. Agency for International Development (USAID), U.S. Africa Development Foundation (USADF), Overseas Private Investment Cooperation (OPIC), and the Power Africa Initiative (PAI), among others. A strong case was made for these instruments to be better coordinated and leveraged so as to support diplomacy, development, and defense more comprehensively and to increase the added value of American strategic engagement. Members also noted that a significant amount of patience is required in resolving protracted conflicts such as has occurred in South Sudan, because even in the best of circumstances it takes time to heal the root causes of violence and to build resilient, transparent, and truly democratic institutions and systems. Africa, they noted, is not unique in this regard. Much more needs to be done to develop more proactive and strategically-focused defense relations between Africa and the United States, the Chapter members said. Alumni members observed that too often, African and U.S. partners do not align their interests beyond narrow national security issues, as a result of which the broader U.S.-Africa engagement lacks depth, local African ownership, and longer term vision on the part of both American and African partners. 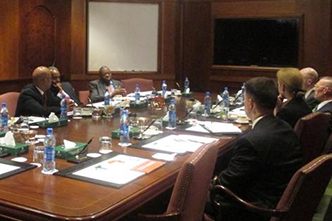 Members suggested that U.S. Department of Defense (DOD) programs need to be more closely aligned to support the evolving African Peace and Security Architecture at the central level in Addis Ababa, site of the African Union headquarters, and the regional level among the Regional Economic Communities (RECS). Because African conflicts are deeply rooted in social cleavages, as well as a lack of strong institutions and uneven development, the application of combat power, though useful, is insufficient in bringing sustainable African development, the Chapter members said. Other instruments of national power, including development, economic support, trade and investment, and the provision of technical expertise in conflict resolution, also should be applied, they said. With regard to hard security, members urged the United States to focus on providing niche capabilities such as airlift, surveillance, and reconnaissance, but also advised the DOD to pay attention to improving the quality of professional military education on the continent. Much of this will depend greatly on the degree to which African military systems adapt the training that African military professionals receive in the United States to their own local conditions. Prof. Tarekegn, the historian whose book on Eritrean military history was published by Yale University Press, made the case for the for a better understanding among African and U.S. partners about each other’s strategic and military cultures so as to strengthen understanding at all levels of the U.S.-Africa defense partnership. The AU structures were discussed at length. The ISS produces the Annual Review of the AU Peace and Security Council, a product that captures policy, institutional, and operational issues in the Council and which could be a useful tool for DOD planners and policy makers, Chapter members said. Participants also urged American and African partners to incorporate civil society, media, and academia in defense programs and discussions so as to promote greater African awareness and ownership of the AU’s evolving architecture. Cases in point include the role of ISS and other non-governmental organizations, such as the Africa Center for the Constructive Resolution of Disputes (ACCORD), in developing the AU’s Civilian Peacekeeping Doctrine, as well as the AU’s mediation capability. Finally, the meeting discussed the need to improve decision making in the African Peace and Security Council (APSC). The principle of consensus in decision making at times constrains the ability of countries to take on more robust leadership when required. The alumni community members also urged African nations to take more seriously the challenge of sourcing domestic funding for Africa’s peace and security operations. The ACSS International Chapter brings together African military and civilian leaders who have participated in various Africa Center programs since its founding in 1999.